These Animals under a Leaning Tree wall decals make any room look magical! Our wall decals are ideal for offices, living rooms, entryways, classrooms, even your car or glass shower doors! Tree decal (with leaves) measures approximately 60 inches wide by 65 inches tall. Elephant measures 17 inches wide by 16.6 inches tall. Giraffe measures 18 inches wide by 36 inches tall. Leaves vary in size from approximately 1 - 7 inches in diameter. Colors shown - Dark Brown Matte, Pistachio matte, Light Yellow matte, and Ice Blue matte. Available in any FOUR colors of your choice! 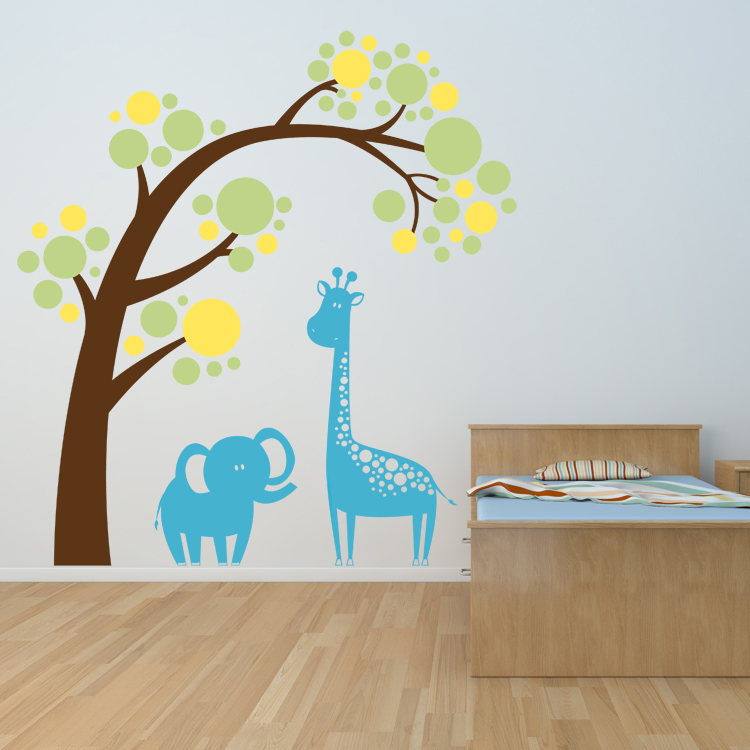 Our Animals under a Leaning Tree wall decals will come separately so you can place them however you choose! Tree will come in one color. Animals will come in one color. Polkadots will come in two separate colors. I purchased the live, laugh, love swirly branch and love love love it! With a little help it was on the wall in no time and looks terrific. After I ordered I realized the size was too big for what I needed, I contacted Dali and they made a new one and shipped out right away. I will definitely recommend Dali Decals to everyone! I got the cherry blossom branch. Beautiful quality. I love it! I love my decal! I used the wild grasses decals to actually use as a headboard for two twin beds. I turned my oldest daughters room in to a guest room. These decals give the room a cute touch. It came out exactly as I pictured it! Will order another decal when I redo my power room. Thanks so much.